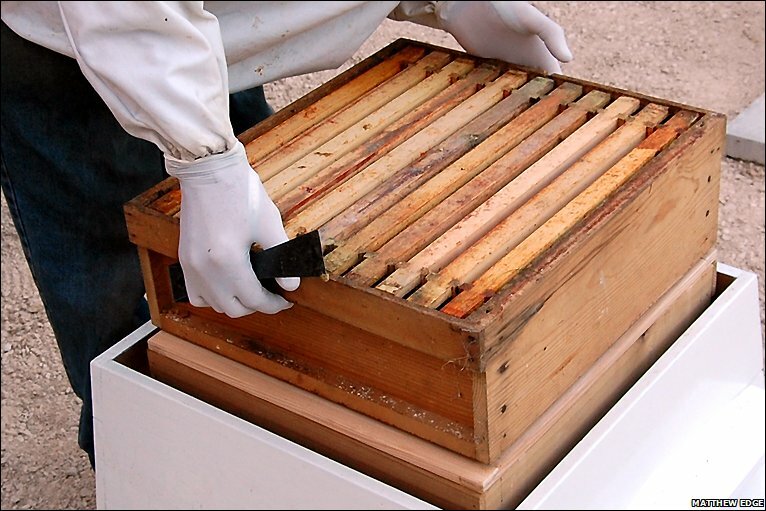 This summer there has been a lot of talk in our neighborhood about beekeeping. Our elected city officials have started an apiculture pilot project, but the actual location has been kept secret. One sunny Saturday as I cycled past the large poplar trees in the Champ des Possibles, a field at the end of our street, I spotted a small fenced in area with two supers, or the wooden boxes used in beekeeping. Hmmm...was this the borough's pilot project? Or was this some guerrilla beekeeping on the CN-owned field? A small sign had been placed in front with the beekeeper's contact information. I got in touch and met with our apiculturist, Kathryn Jezer-Morton, at her bee station last Friday morning. 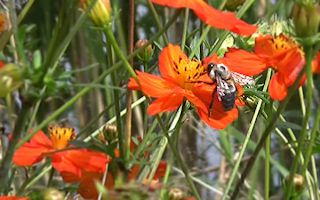 The granddaughter of a beekeeper, Jezer-Morton was drawn to apiculture because of her concern for Colony Collapse Disorder, which is killing bee colonies. The disorder has been attributed to many things, such as the widespread use of insecticides, synthetic fertilizers, genetically modified seeds and cellular phones, in addition to viruses and mites, but a consensus among scientists has yet to be reached as to the cause. Jezer-Morton, who was 8 and a half months pregnant, told me that she had taken a beekeeping course at an agricultural college in Mirabel. She and husband Gray Miles had purchased a queen bee, a 5,000-bee colony, 2 supers and 20 frames, which fit inside the supers, for $260. They had initially planned to set up their station on the roof of a friend's home, but the climb onto the roof would have been too treacherous for a pregnant beekeeper. She and her husband consulted a group that oversees the Champs des Possibles and decided to set up their station there. "It's the perfect guerrilla activity," I said. "There's no need to worry about vandals." "So far, we've just had a few stakes removed from our fencing," said Miles, "but in general, the buzz of the bees triggers a flight response in most people." The couple set up the colony in May of this year, and it has now grown to about 15,000, but apparently this was lower than expected. "We think that our queen is old and tired," said our beekeeper. "Her pheromones, which attract the male worker bees, are weak." Their option is to "requeen," which involves finding a replacement. A new queen can be purchased online at retailers like FW Jones in Bedford, Quebec, one of the largest beekeeping suppliers in Canada, but there are risks in retiring the old queen and bringing in a new upstart. "There's a chance that the colony might reject and kill the newbie," said Jezer-Morton, "We're hoping that the colony might raise its own queen." How would you feel about having a bee colony close to your home? Of course, most of you will be wondering about honey. Just how much might an operation this size produce? Our novice beekeepers said that it was difficult to know for certain. They didn't want to take away too much honey, as the bees feed on it throughout the winter. In the coming years, Jezer-Morton and Miles would have a better idea of how much honey they would be able to give away. I'm sure that I will not be alone in wanting to pick up of some of the excess product. As for this being the borough's beekeeping pilot project, I was sorrily disappointed. Our beekeepers were not involved, but expressed an interest in participating. We discussed how a barter system among city beekeepers would be beneficial, as would a collective for purchasing costly equipment, such as an extractor, which could be shared by everyone. Jezer-Morton also thought that it would be a great idea if the city employed an adviser who could visit the various beekeepers and offer some tips. There are many apple trees in the Champ des Possibles. 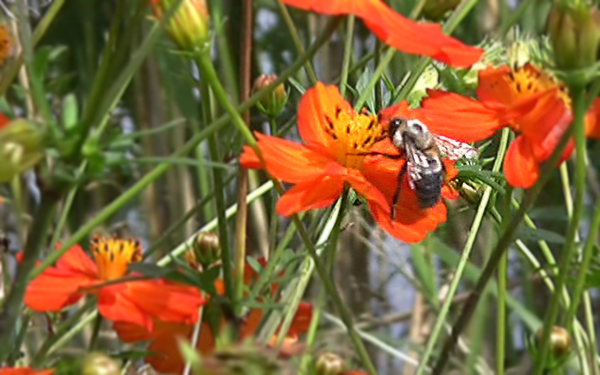 Native bees (like the bumblebees) don’t always cut it when it comes to thorough pollination. The honeybee systematically explores all the five corners of every apple blossom. We’ll get far more apples this year. Even more next year. Although a bee sting is a painful and sometimes a scary experience, we can't forget that we would not have any fruit or other foods if it weren't for the pollination efforts of our busy bees. For some great pictures of this beekeeping project visit Flora Urbana. : The Mile End Buzz Around BeekeepingTweet this! Bee good if they can breed their own. My cousin Trevor has been breeding Queen bees for many years & yes, sent them to Canada too. Yes, I just learned from our beekeeper that bees are actually sent in the mail! Who would've guessed! Thanks for stopping by my blog and commenting... of course I had to swing by and check yours out... great blog! I am now following and look forward to reading more of your stuff. Beekeeping is a fascinating endeavor. It's not like any other that I have done. I encourage anyone who is interested to take a class, hang around a bee yard, read.....we need all the help we can get with the CCD. Great post. Thanks a lot for stopping by Kim, and great comment Sandy. I can just imagine the frightened postal worker upon discovering that s/he had a colony of bees in his/her hands. I must admit that I find the whole beekeeping project fascinating. I especially liked the smoking part. Apparently, when bees smell smoke they think that they're home is on fire, so that start eating as much honey as possible. While they are busy doing this, the beekeeper swoops in and does her work. Fascinating subject, hope you keep track of the ongoing saga. Does anyone know where exactly she learned about it in Mirabel? An agricultural school, a special class?